Which means there are two beautiful baskets on my porch that magically appeared. This happened about the same time last year - and I am very thankful. Have I ever told you how much I love surprises? These ones are begonias - LOVE them! They make a gorgeous pair of sentinels as you walk up my steps. Thank you Flower Godmother, or Godfather, wherever you are. 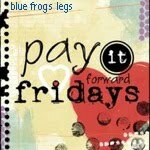 Everyone knows how nice it is to receive a random act of kindness, so lets give a few this weekend. Go out into the world and radiate some sunshine. Have a great one everybody, and feel free to share your random acts of kindness and Pay it Forwards here. Sweet! What a great surprise!!! I try to do a little something each time I'm out in the world... you know, let someone pull out in front of me, or go ahead of me in the grocery line, let someone have that REALLY good parking spot... stuff like that. I also try to smile... even when I don't feel like it - beause you never know who just may need it. My neighbor used to leave us fresh veggies on our deck. We would pull into the drive and know Bob had been there. He was one really sweet guy. It sure was. And me being such a visual person, I was on cloud nine!!! !